Freddie Mac released a report recently you can find here: Nowhere to go but up? How increasing mortgage rates could affect housing. The findings addressed the impact the projected rise in mortgage rates could have on the housing market in the near future. Every month our team leads a market update for Realtors in our brokerage and the surrounding market. One of the concerns we hear almost monthly is whether increasing interest rates will lead to falling house values. Therefore Freddie Mac concluded home values are not adversely impacted by rising interest rates. 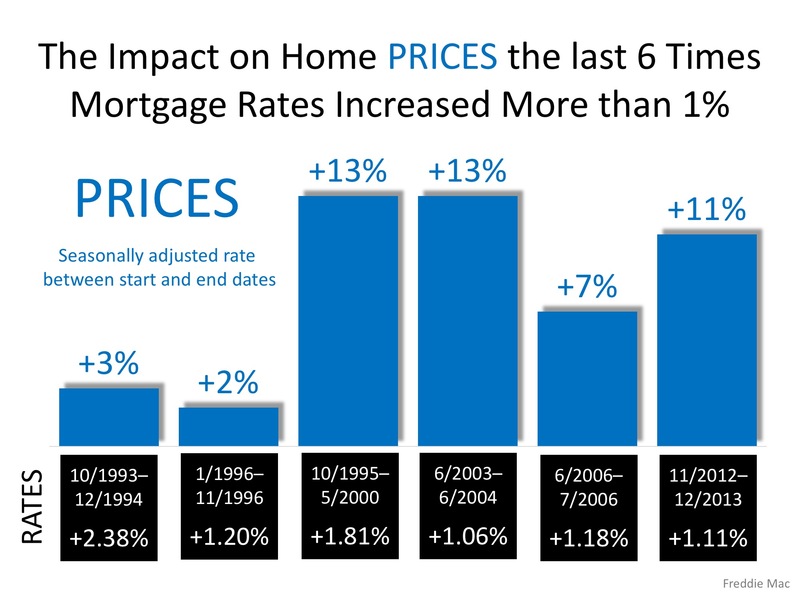 Check out what happened to housing prices the last 6 times interest rates rose more than 1%. Graph Credit Keeping Current Matters, Inc.
Don't hold off on purchasing a new home simply because you think the increasing rates will cause home prices to drop. We may see a reduction in the aggressive appreciation rates we are seeing in many markets, but the likelihood of seeing home prices fall is slim to none.